It’s 1909, and The Stern & Saalberg Company has a candy hit. 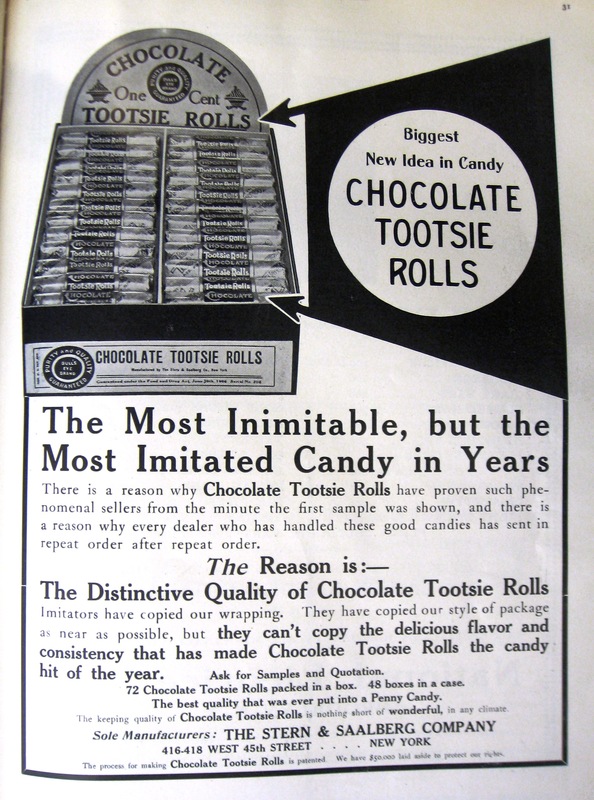 Americans just can’t get enough of their “Chocolate Tootsie Rolls.” Those Tootsie Rolls have gotten so popular that they have to take out ads in the trade papers cautioning their customers against accepting inferior imitation. But who is this “Stern & Saalberg” who is taking all the credit for Chocolate Tootsie Rolls? Where is Leo Hirschfeld? As candy nostalgists know, Leo Hirschfeld is the official hero of the Tootsie Roll saga. Today, Tootsie Roll is one of the top candy sellers in the U.S. And it all started with Leo, a poor Austrian immigrant with a dream and some family candy recipes. According to the Tootsie Roll Industries company history, Hirschfeld began selling the chewy candies in his little shop in New York City in 1896. The next thing you know, it’s 1917, Tootsie Rolls are a huge commercial hit, and the company changes its name to “The Sweets Company of America.” From that point out, the Tootsie empire grows in leaps and bounds. The story of Tootsie Roll after 1917 is one of a big candy company getting bigger. There doesn’t seem to be anybody named Stern or Saalberg in official Tootsie Roll history. So what was happening in that murky gap between 1896 and 1917? And what happened to Leo Hirschfeld? Let’s follow Leo along as he leaves his native Austria and struggles to make it in America. When Leo got off the steamship Neckar in the New York Harbor in 1884, he had two things: big dreams, and empty pockets. His father’s trade was candy, so that’s what he knew. He got to work. He set up shop in Brooklyn, sold some candy to the neighborhood kids. So far, so good. But here’s where things get a little complicated. The common version of the story (here or here) is that Hirschfeld came up with the candy that would become Tootsie Rolls in 1896, made and wrapped them by hand, and sold them in his Brooklyn shop. A year later, seeing their popularity, he “merged” with Stern & Saalberg. A nice story, right? But I uncovered evidence that blasts some serious holes in the official line on Tootsie Rolls. In 1913, a reporter for the Pittsburgh Press sat down with Hirschfeld and three others who had shared his cabin on the Neckar in 1884. All of them were by then extremely wealthy. Each had a remarkable rags-to-riches story. One was a movie mogul, another made a fortune in fancy goods. And Hirschfeld’s story was all about the candy business. “[Hirschfeld] fought his way up until he became Superintendent of the Stern-Saalberg concern. Then he invented a certain children’s confection”…the Tootsie Roll. Notice the way Hirschfeld told the story to this reporter in 1913: first he went to work for Stern & Saalberg, then he invented the Tootsie Roll. And what’s all this about “fought his way up” in the Stern & Saalberg company? That doesn’t sound exactly like a merger of equals. I went looking for a record of Hirschfeld in Brooklyn. The Brooklyn city directory lists Hirschfeld as a “confectioner” with a home address on Myrtle Avenue until 1890. Then in 1891, he moves to Manhattan. His new address is 356 W. 45th Street. So, no candy shop in Brooklyn in 1896. But why did he move? The 1890s were boom years for candy making technology; making money in candy was all about volume, and volume was all about the machines. A good patent could be worth a lot. But in 1894 and 1895, the U.S. Patent Office records that Leo Hirshfeld assigned half of each of these patents to Julius Stern and Jacob Saalberg. Why would he do that? Here’s what I think happened: sometime between May 1, 1891 and May 1, 1892, Hirschfeld moved to Manhattan because he took a job with Stern & Saalberg. His Manhattan address is only five blocks from the offices of Stern & Saalberg Co. at 311 W. 40th Street. This also explains why he would assign a half interest in his patents to Julius Stern and Jacob Saalberg. They were his employers. Well before Stern & Saalberg started selling Tootsie Rolls, they had another hot item: Bromangelon Jelly Powder. Jelled desserts were all the rage at the turn of the century. Jell-O is the only one we remember, but around 1900 you could have your pick of such temptations as Jellycon, Tryphora, and Bro-Man-Gel-On (also known as Bromangelon). And who had invented this alchemical substance with the doubly masculine name, a pink powder which, when you added hot water, tranformed into sweet fruity jelly? Why, Leo Hirschfeld. The first documented evidence of the existence of Bromangelon that I have uncovered is the catalog for the Nineteenth Triennial Exhibition of the Massachusetts Charitable Mechanic Association held in Boston in October and November of 1895. Stern & Saalberg participated in the Exhibition to showcase their remarkable product, Bromangelon. They explained that the unusual name meant “Angel’s Food.” They may have just been trying to impress the judges with this little tid-bit. They seemed quite casual about calling it “Bro-Man-Gel-On” or “Broman-gelon” in their ads, and neither of these seems to have anything to do with angels. Angels or no, the judges, finding the ingredient “pure” and the taste “pleasant,” awarded this dessert jelly preparation a Bronze Medal. Bromangelon was big business for Stern & Saalberg from the late 1890s through the first years of 1900. Jellied dessert powders like Bromangelon were one of the first “convenience” foods that would transform American cooking in the twentieth century. Dessert was suddenly just a matter of some hot water and some imagination. And what you could do with the stuff. An ad for Shredded Wheat Biscuits in Good Housekeeping Magazine in 1900 included a recipe and a full color illustration of “Shredded Wheat Biscuit Jellied Apple Sandwich” that involved soaking the shredded wheat in Bromangelon to startling effect. Many other recipes in popular magazines of the early 1900s included “Bromangelon” as an ingredient to whip up such novelties as “Nut Bromangelon,” “Bromangelon Snow Pudding,” or “Orange Sponge.” Bromangelon is long gone, but in the 1900s and 1910s, it was well-known, and well-used, all over the country. Stern & Saalberg were exhibiting Hirschfeld’s jelly powder in 1895. Together with the patent assignations in 1894 and 1895 and the evidence of Hirshfeld’s move from Brooklyn to Manhattan in 1891, this adds up to a pretty clear case for Hirschfeld working for Stern & Saalberg well before anybody started thinking about Tootsie Rolls. Hirschfeld worked his way up at Stern & Saalberg Co. In 1904, the entry for Stern & Saalberg in the Trow Co-partnership and Corporation Directory of New York City mentions Hirschfeld for the first time, naming him as one of three “directors.” By 1913, Hirschfeld is the Vice President of Stern & Saalberg, and seven hundred million pieces of Tootsie Roll have rolled out the door and into the mouths and bellies of America. Seven hundred million pieces of candy, even lowly penny candy, is lots of dollars. Hirschfeld and Stern & Saalberg did very well together. And when did anyone start thinking about Tootsie Rolls? 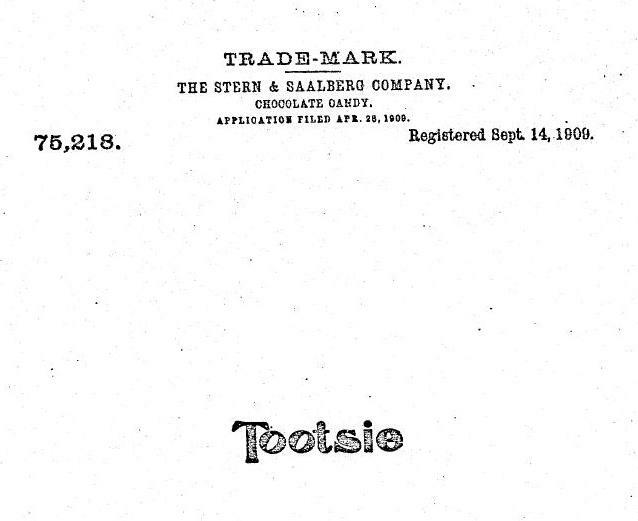 The Stern & Saalberg Co. applied for a trade-mark for “Tootsie” for their “chocolate candy” in November 1908. The trade-mark was registered on September 14, 1909. They stated in their application that “Tootsie” had been used in association with the candy since (drum roll, please)…September 1908. There was a “Tootsie” in the Stern & Saalberg Co. business before September 1908, but it didn’t have anything to do with candy. Booklets printed to advertise Bromangelon featured “Tattling Tootsie,” a cute little girl whose mischief seems only tangentially connected to the joys of gelatin. We do know who this Tattling Tootsie is. Every story of the genesis of Tootsie Rolls mentions Clara, Leo’s little daughter. Her nickname was “Tootsie,” and the story goes that the candy was christened in her honor. But first, she did her time as the child spokes-model for fruity gelatin. Did Hirschfeld make or sell a candy resembling the one that would be marketed as “Tootsie Roll” some time before? Maybe. But there is another piece of the Tootsie Roll puzzle. In May of 1907, Hirschfeld applied for a patent for a candy-making technique that would give Tootsie Rolls their distinctive texture (U.S. Patent 903,088; for more on the patent, see my Tough Tootsie, and How it Got to Be That Way). 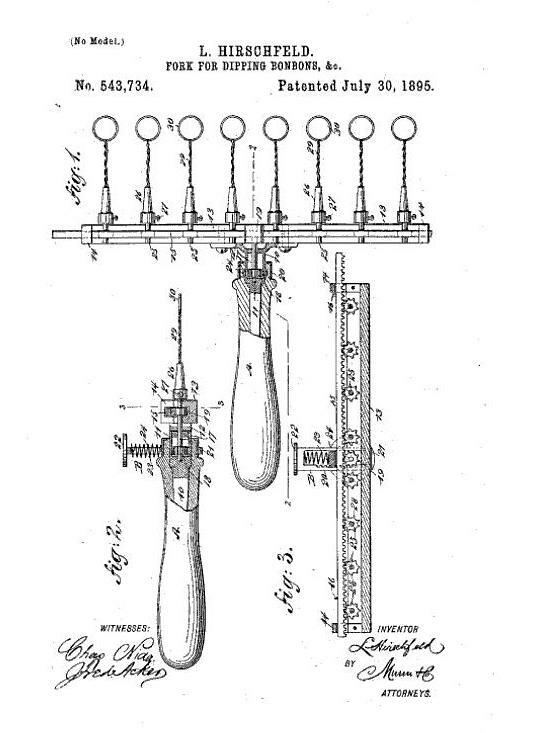 The patent was awarded in November, 1908. The Stern & Saalberg Co. started selling “Tootsie Rolls” in September 1808, and really began a big advertising and marketing push in 1909. All the patents, trade-marks, and advertising put Tootsie Rolls in motion between 1907 and 1909. As far as I can gather from the evidence, the invention of Tootsie Rolls in 1896 in Hirschfeld’s little Brooklyn candy store is a myth. 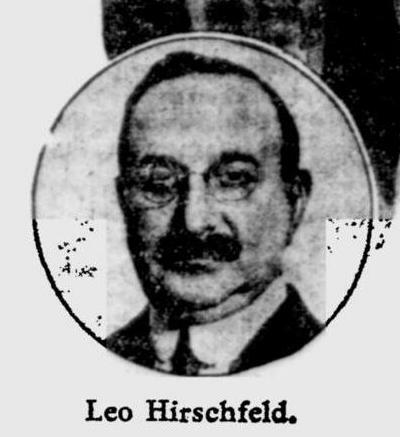 Tootsie Rolls made Leo Hirschfeld very rich. He couldn’t have done it on his own, though. Without Stern & Saalberg, an established business with sufficient capital to launch a major candy line, Hirschfeld would have languished in his little Brooklyn house, selling bits of candy to the neighborhood kids. And without Hirschfeld and his inventions, The Stern & Saalberg Company would have gone on as a small candy wholesaler offering “Fluffy Mints” and “Diamond” brand gelatin dessert mix. But The Stern & Saalberg Company went on to become The Sweets Company of America, which in turn became Tootsie Roll Industries, a business today worth well over one billion dollars. And what happened to Leo Hirschfeld? That’s the official story from his obituary, at any rate. I think it was more complicated. By the time Stern & Saalberg reorganized as The Sweets Company of America in 1917, Stern and Saalberg were both retired. But Hirschfeld, who had been there longer than anyone else, had never risen beyond Vice-President. Others came in and took over the company. Hirschfeld was a brilliant inventor, but maybe not such a great business man. He was pushed out at The Sweets Company of America, so he ventured out on his own to start fresh with the Mells Candy Corporation. But nothing came of it. Mells was bankrupt by 1924. What was really going through Hirschfeld’s mind that January day in 1922 when he pulled the trigger? Someone else was selling his Tootsie Rolls, and Mells Candy had nothing to show. He died wealthy, to be sure. But if he had hopes of building a candy dynasty, one he could pass on to his own children, those hopes were dashed by The Sweets Company of America. Chocolate? Tootsie Roll Is it chocolate? or something else? Another Tootsie Girl No, the candy wasn’t named after Leo’s daughter. Here’s why. Sources: In addition to the sources linked or referenced by name in this post, I also consulted Leo Hirschfeld obituaries in New York Tribune 14 Jan 1922 and New York Times 14 Jan 1922; announcement of Mells bankruptcy auction, New York Times July 30, 1924; various announcements of financing and directors meetings relating to The Sweets Company of America, Wall Street Journal 1919-1920; city and business directories for New York City, Manhattan and Brooklyn.